Over the past few months, I've been in search of some new lunch spots. I work downtown and have plenty of options within walking distance, but I was finding myself revisiting the same old places over and over. One thing I love about the lunch hour is that you can go to a higher end restaurant and pay the same thing you'd pay at a sandwich shop, but get a much better meal and experience. Last week I had lunch with a few girlfriends at Pomegranate On Main. I've had dinner at Pomegranate before, but never lunch. Their lunch menu was very reasonably priced, and the service was excellent. 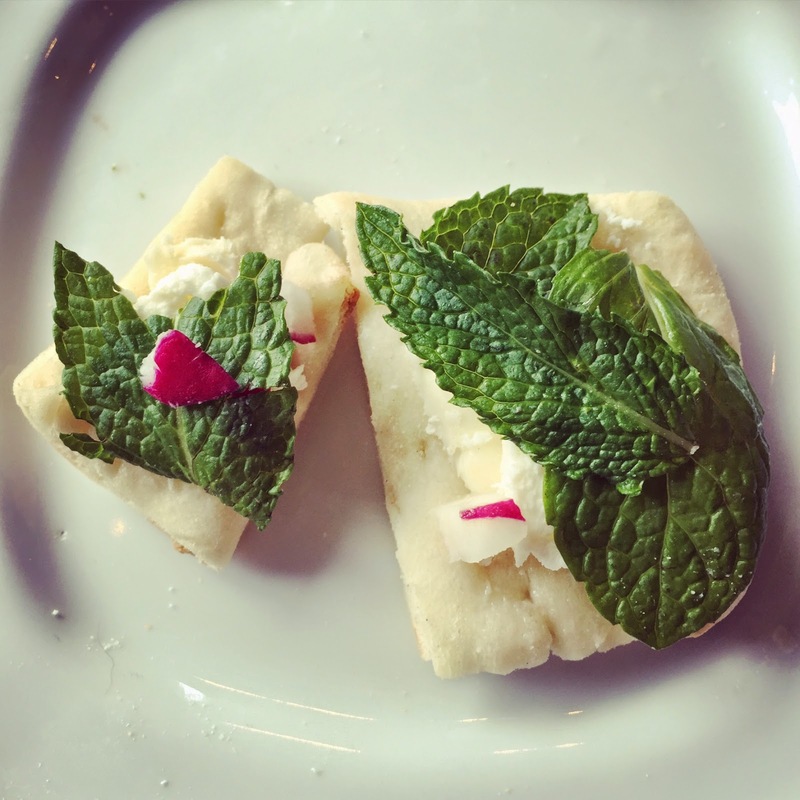 They start every table out with a traditional Persian breakfast of warm flat bread, salted butter, feta, radishes, and mint. I'd never had this combo before, but it was incredible. The saltiness of the pita and butter combined with the mint was a totally unexpected tasty flavor combination. Maybe it's just the cheapo in me, but any time a restaurant gives you something complimentary other than a typical dry bread basket I'm immediately impressed. Knowing that they've taken that extra step is always a plus in my book. For my entree, I had the Chicken Wrap. Marinated chicken, tomatoes, onions, pickles, parsley, mayo, and Persian citrus dressing served in a flat bread. Oh my. 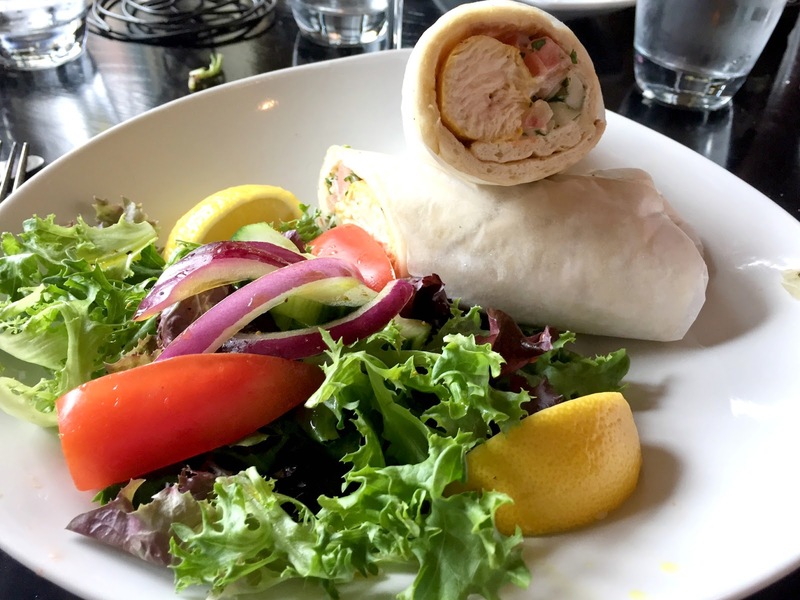 Chicken wraps are typically dry and uninspired, and this sandwich was far from either of those. The chicken was perfectly cooked and juicy, and the acidity of the pickles and citrus dressing were just the right addition. It's also served with a lightly dressed side salad, a bang for your buck at it's $9.00 price point. I love finding new lunch spots downtown, and will be returning to Pomegranate very soon! I have yet to try Pomegranate for any meal. It's so cool that you are downtown for lunch. I work at GE so I feel like all the lunch options are chain restaurants. Any local suggestions on this side of town? This place looks really good. I would have never thought of that flavor combination before, looks like I'll need to try it the next time in Greenville.